I made the Cheesy Chicken Sausage Potato Skins as part of a sponsored post for Gold’n Plump. Potato Skins are another appetizer that my family loves. We order them at restaurants and purchase the frozen version to cook at home. Zack has been talking about my bloomin‘ baked potatoes and asking me when I am going to make them again. Instead, I decided to make cheesy chicken sausage potato skins and he helped me. While adding the cheese, he told me that his mouth was literally watering because they looked and smelled so good! 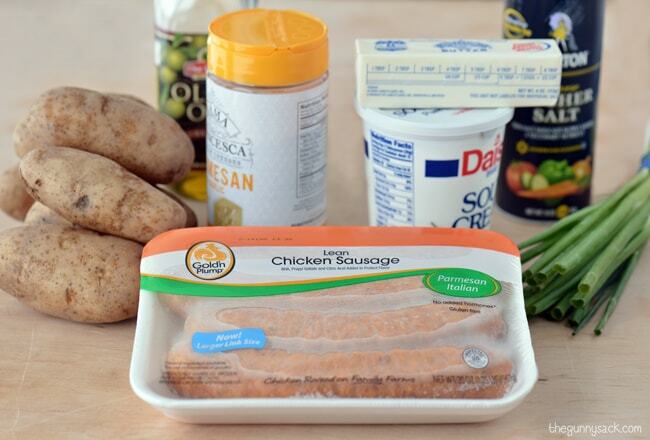 For the sausage in these potato skins, I used Gold’n Plump Parmesan Italian Chicken Sausage. 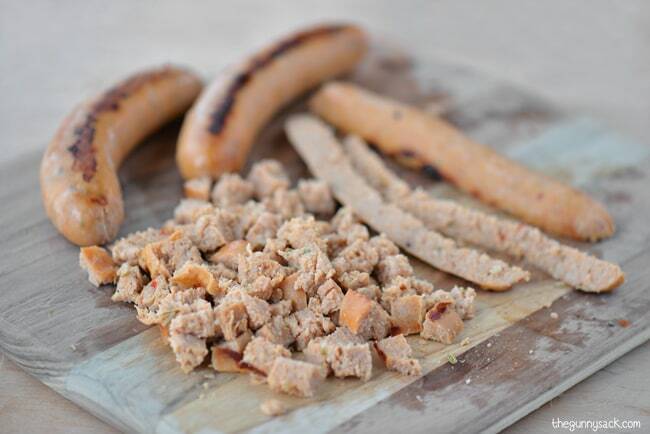 These sausages have 50% less fat than pork sausage, are gluten free and contain no added hormones. In addition to the chicken sausage, you’ll need potatoes, parmesan, garlic salt, Italian seasoning (my parmesan is a mixture of those three, but they can be added separately) sour cream, coarse salt, shredded cheddar cheese, olive oil and green onions. Scrub and rinse the potatoes. Pat them dry and poke all over with a fork. 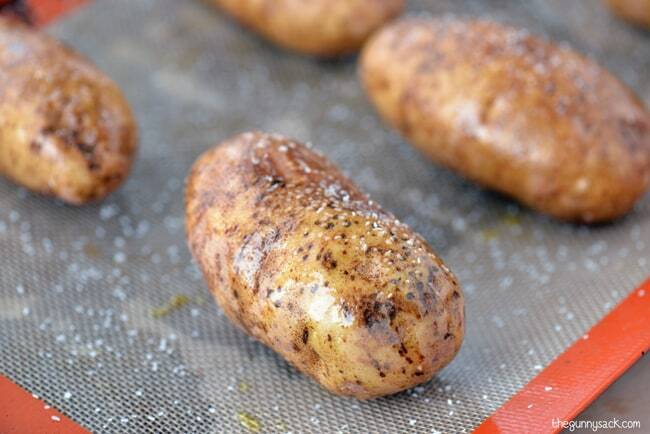 Rub the potatoes with olive oil and sprinkle them with coarse salt. Bake the potatoes at 350 degrees for one hour. Brush the inside and outside of the potato skins with melted butter and sprinkle with parmesan, garlic salt and Italian seasoning. Place them skin side up on the pan and return to the oven to bake for an additional 15 minutes. While the potatoes are baking, brown the thawed Gold’n Plump Parmesan Italian Chicken Sausage in a skillet at medium heat for about 7 minutes, turning frequently. Add about 1/4 inch of water to the bottom of the pan, cover and reduce heat to simmer. Continue cooking for 12-15 minutes until cooked through. Then, dice the sausages. Return sausages to skillet to brown for a couple of minutes, stirring constantly. 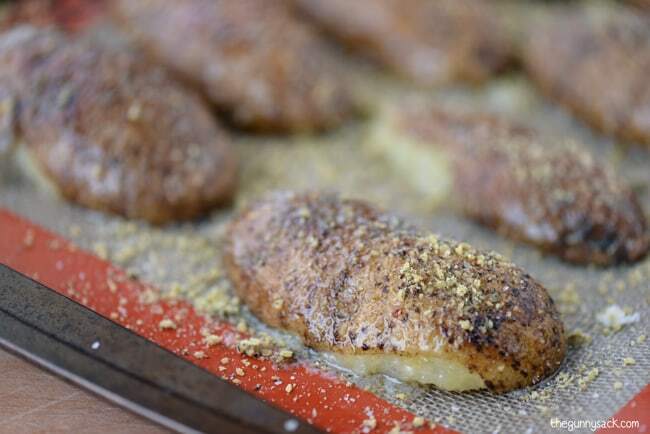 Remove the potato skins from the oven and flip them over. Sprinkle them with shredded cheddar cheese, chicken sausage and another sprinkle of shredded cheddar cheese. Return to the oven and cook for 3-5 minutes, until the cheese melts. To toast the cheese, put the potato skins under the broiler for a minute or two. 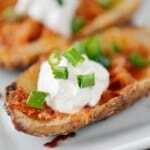 Top the potato skins with sour cream and chopped green onions before serving. These cheesy chicken sausage potato skins were outstanding! The outside of the potato skin is crisp, salty and full of flavor from the parmesan and seasonings. The insides have a thin layer of soft potato topped with melted cheese and delicious Parmesan Italian chicken sausage. 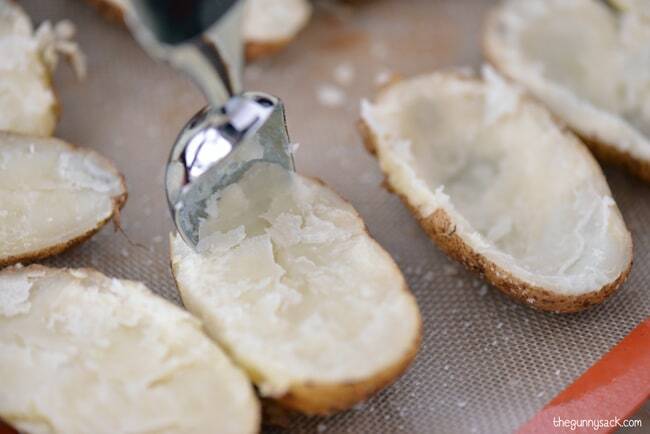 Brush the inside and outside of the potato skins with melted butter and sprinkle with garlic salt and Italian seasoning. Place them skin side up on the baking sheet and return to the oven to bake for an additional 15 minutes. 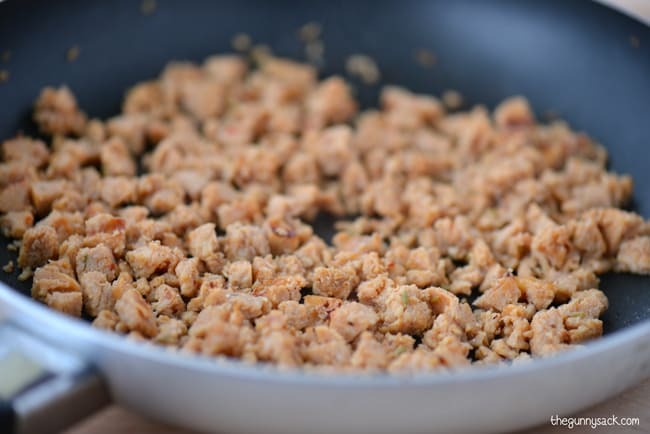 While the potatoes are baking, brown the thawed Gold’n Plump Parmesan Italian Chicken Sausage in a skillet at medium heat for about 7 minutes, turning frequently. Add about 1/4 inch of water to the bottom of the pan, cover and reduce heat to simmer. Continue cooking for 12-15 minutes until cooked through. Then, dice the chicken sausages. Return the sausage to the skillet to brown for a couple of minutes, stirring constantly. 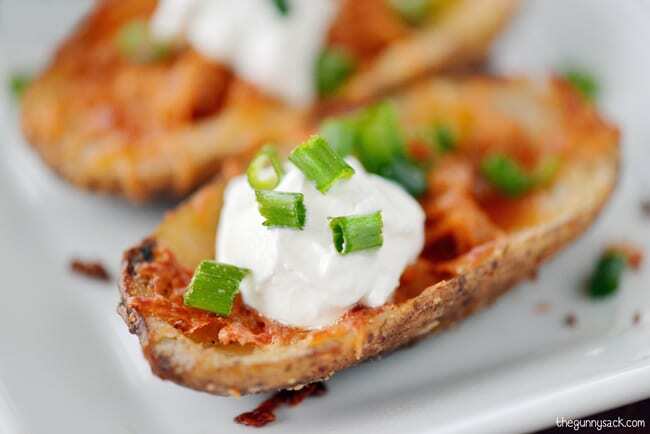 Top the potato skins with sour cream and chopped green onions before serving. Thanks Jocelyn! I can’t wait to make them again during the holidays. Hi Tonia! I’m new to your website and already love it! Your tutorials are awesome from beginning (showing the ingredients) till the finished product! You have a faithful follower!! I love potato skins! I want to order that as my dinner when we got out to eat. These look delicious and chicken sausage sounds good! 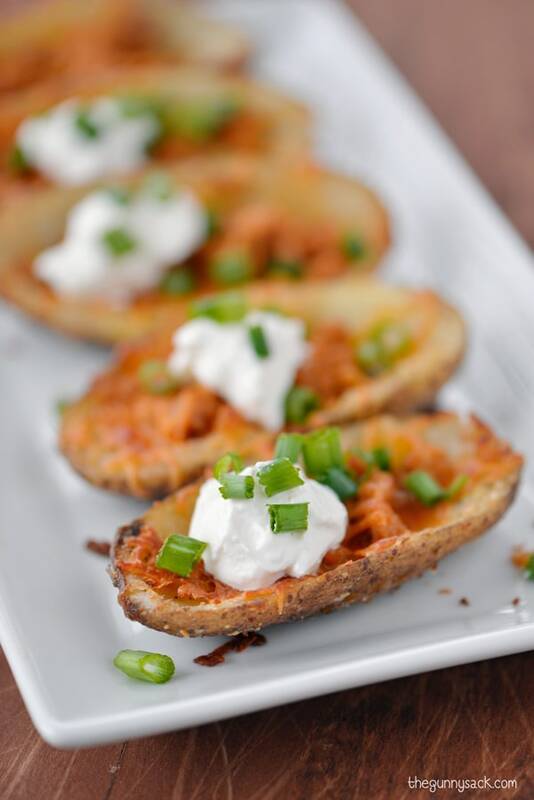 Tonia, potato skins are one of our favorite game day snacks, so I’m excited about trying a different variety! Loving the sausage, cheese, and sour cream combination of yours. Thanks for the recipe! 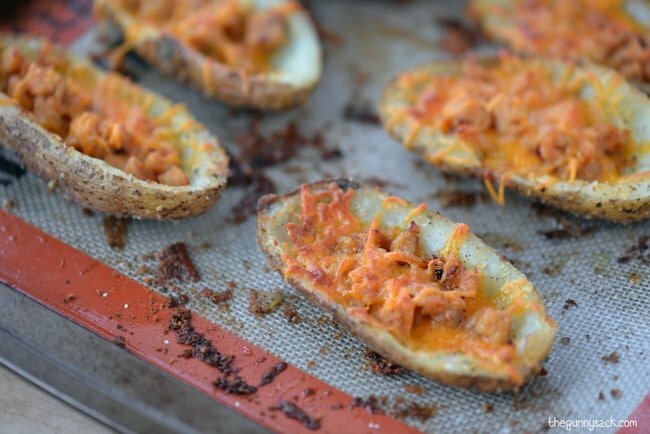 I love potato skins and these looks like the perfect way to entertain this holiday season! Love the addition of the sausage! Thanks Julie! They were delicious! We love potato skins! These sound wonderful! Aren’t they awesome! Thanks Jessica!